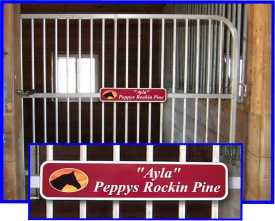 These Personalized Name Plates are a great way to add a splash of color to your barn, animal stalls, mailbox, house, camper, dog kennel, etc. Made from a 1/2" thick solid PVC signboard these colorful and unique 1-sided signs are 3.5" x 16" and are designed for long term indoor or outdoor use. They are available in a text only version or choose from hundreds of available graphics. They make excellent gifts! add $2.00 for each additional sign. Please click the graphic that you want to use on your sign. You can select a different category from the dropdown list above. If you do not see a graphic here that suits your needs, please email us with your request and we will check our files and try to locate it for you. Use correct punctuation and enter CAPS or mixed case letters exactly how you want them to appear on the sign. For personalized nameplates, we do not email sign proofs for your review. Please double check your spelling and punctuation carefully. Congratulations, you have finished designing your name plate! When you click the [Add to cart] button below, your name plate will be added to your shopping cart. Please check your design choices and quantity on this screen before continuing, as you will not be able to make changes within the shopping cart.